"Boule" is the dog in the comic strip "Boule et Bill" designed by Roba. "Boule" is a french word that means "ball" and in that famous Ptôse song it's the name of a dog. The lyrics say : "Boule, Boule, viens ici mon chien, viens ici sale chien. - Non non non, je n'viendrai pas, houpla houplala" ("Boule, Boule, come here my dog, come here nasty dog - No no no, I won't come, houpla houplala"). This compilation was created by all artists that had released music through Ptose Production Presente, a cassette label. The christmas cover is because the tape was sent out to all the artist as a christmas gift. 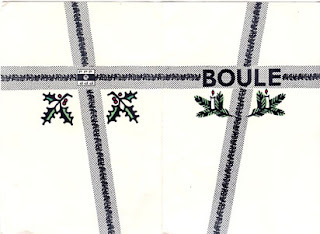 The first edition (not shown here) was a limited edition of 100 copies and had "Joyeux Noël" on the cover. This one is probably the second edition, released some years later with a slightly different track listing.